Asphalt Recycler that saves you money. Recycle old pavement/create new hot mix On demand & on the spot (eliminate the need for costly hot mix from the asphalt plant). Make Permanent Repairs More Economically. Eliminate Waste. Work Even in the Winter, around the clock. 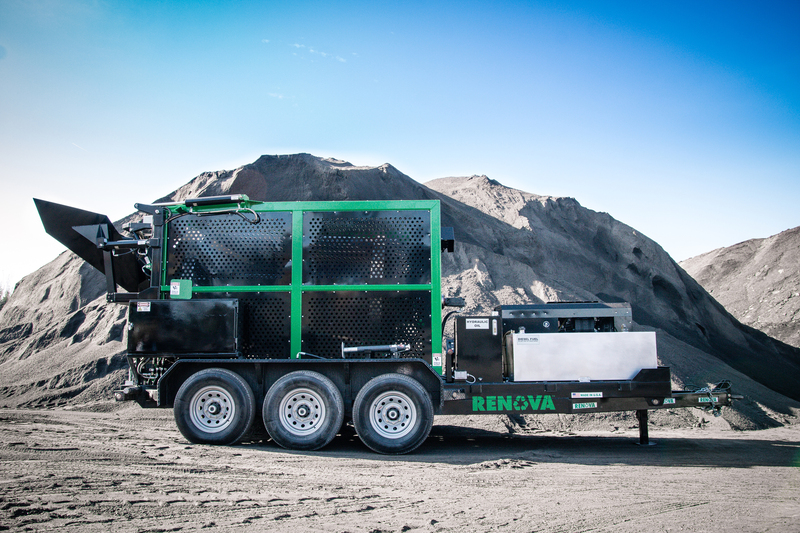 The RENOVA is an American-made, heavy-duty mobile asphalt pavement recycler that converts asphalt pavement as large chunks or ground millings into asphalt plant-quality hot mix. RENOVA combines highest heat transfer method with whole-batch mixing and proprietary rejuvenators to produce asphalt with high-level elasticity, resilience, adhesion and compactability. RENOVA is the only recycler that can convert reclaimed asphalt pavement into cold patch to facilitate time-of-use flexibility. Load RENOVA’s mixing drum via hydraulically-operated hopper or at ground level. RENOVA’s batch process permits flexibility to travel to repair site with 2 tons of mix, reheat mix when needed, check mix temperature at any time, discharge directly into front-end loader or into a waiting application, adjust additives, and dry out wet millings. Time length of 2-ton batches varies by conditions and state of millings, can be 12-20 minutes with capability of 8 to 10 tons/hour production. The RENOVA is appropriate for patching potholes, utility cuts and other small asphalt repairs year round regardless of the outside temperature. The savings realized pay for the machine quickly as you recycle old pavement instead of buying replacement hot mix from the asphalt plant. Produce a more durable, longer-lasting, superior quality asphalt material at the repair site in the exact quantity needed; with no waste. RENOVA yields quality results with lower costs. 91 Gallon Diesel Fuel Tank.